1907 – Not a year of significant historical events. Theodor Roosevelt received the Nobel Peace Prize and Edvard Grieg died at the age of 64 years. King Edward VII ruled in England. It is the era of large industries. The rapid industrial expansion produced huge buildings and high chimney-stacks shape the face of the English capital London. The contrast between bitterest poverty of the working social classes and the extreme wealth of some few created fertile ground for social tensions, which were to lead to events that the still-young century could not anticipate. From a musical point of view, it is the era of Romantic music. Opera and operetta are in full bloom, innumerable premieres of important works are celebrated. The organ also celebrates a comeback. After reaching its zenith in the Baroque era with illustrious organ builder names such as Silbermann or Schnitger and the übervater of all composers J.S. Bach, the organ did not fall into oblivion, but led however a less noticed niche existence.. However, this changed in the 19th century. With the emergence of the opera and of romantic thoughts, the organ culture blossomed anew. The tone of these instruments was no longer oriented towards the forefathers’ Baroque model, but towards the rich emotional orchestral sound of the opera. During this time, it was James Jepson Binns who built an organ for the Anglican Church in the London district of Putney. It was the 413th creation of this great company which, at times, employed up to 100 people and whose company building could absolutely be compared to the factory-like workshops of renowned European organ builders such as Walcker, Sauer etc. With three manuals and 30 registers, op. 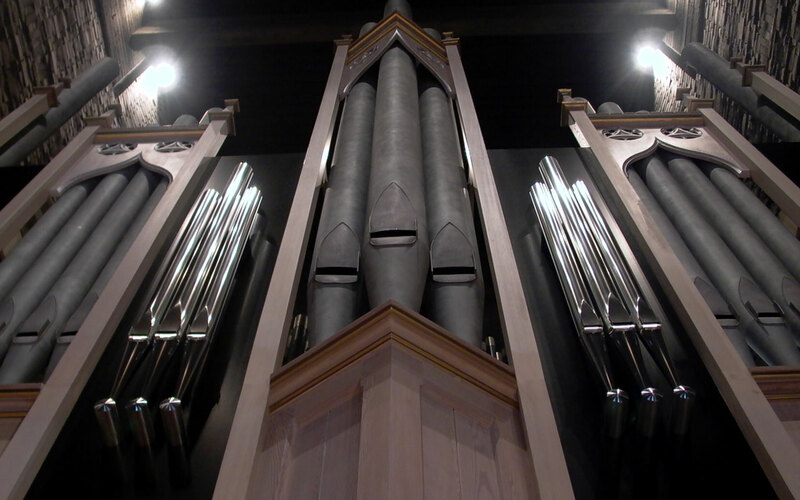 413 became a prime example for the enormous sounds of English-romantic organs with a full-pneumatic slider chest system typical for Binns. The elaborate control within the soundboard using several small and large wedge-bellows permitted an amazingly precise performance. Wide mensurated registers stood beside fine, distinctive solo voices and gave room to a broad spectrum of organ sound, neo-Gothic carvings decorated the softwood housing. Thus, the instrument performed its service over many decades. After the company’s founder’s death, the erstwhile prominent Binns company fell back into insignificance. The organ was therefore overhauled and partly reconstructed by the company Willis in 1953. The original intonation has been maintained nonetheless – which would turn out as a fortune decades later. Towards the end of the 20th century, the Anglican Church also faced increasing financial difficulties. Thus, the church in Putney was profaned, and in 1994 parishioners dismantled the organ and stored at the sanctuary. Some years later, the Andreas Ladach music shop in Wuppertal/Germany discovered the dismantled organ and transferred it to his stock of instruments, located at the former Trinitatis-church in Wuppertal. It seems like the organ had not been dismantled by specialists – many parts were missing or were in poor condition. Thus, the remains of the organ were left in this unfortunate condition for several years until the instrument caught the attention of the “Heilig Kreuz” church in Bonn-Limperich. FNearly 100 years after the organ’s construction, we at Orgelbau Schulte encountered it for the first time. Organ parts of which often only in fragments were preserved did not make it easy to prepare a concept, but it quickly became obvious to all parties that this was a remarkable instrument dozing in a big sleep. The organ parts occupied us for many hours and days. Ideas were presented and dismissed, and held lively discussions. Should it be reconstructed? Which kind of action should it get? Together with the organ-expert Eckard Isenberg of the Archbishopric of Cologne, it was decided that a reconstruction, who’s value in terms of technical, architectural and last, but not least, financial aspects would have been more than questionable, should be abandoned. Our concept intended to realise a symbiosis between old parts and new parts. Much more than simply “give it a new lease on life”, more than a “reuse for financial reasons”. We are seeing therein a new interpretation of a historical work for the “Heilig-Kreuz”-Church in Limperich. The uniqueness of this project not only within the Rhineland, but also nation-wide, made us naturally even happier, when Thomas Schäfer, the parish priest, ordered us to build this organ for Limperich. The whole firm quickly grew very fond of the organ. Especially for this project, Sonja Füßmann and Oliver Schulte travelled more than 600km during the course of a study trip in England in order to extensively “breathe in the spirit of English organ romantic” (see also “Thanks to friends”)..
During many weeks and months, the historical parts were then carefully restored at our company (among others, the small wedge-bellows inside the soundboard as well) and quite a few new enhancements were produced in accordance with the original idea. A time, in which all of us were to tap the full potential of our experiences and learn a lot of new things – a time, in which all of us have grown a little further. In conclusion, it remains to be said that after ten turbulent years, the “Binns 413” has once again found a dignified place and from now on, will sound its characteristic tones as a “Binns – Schulte – Organ” for a long, long time to come.